As USGBC looks overseas to foster further momentum in our mission to transform the built environment, we are excited to announce our latest real-time data platform: international market briefs. 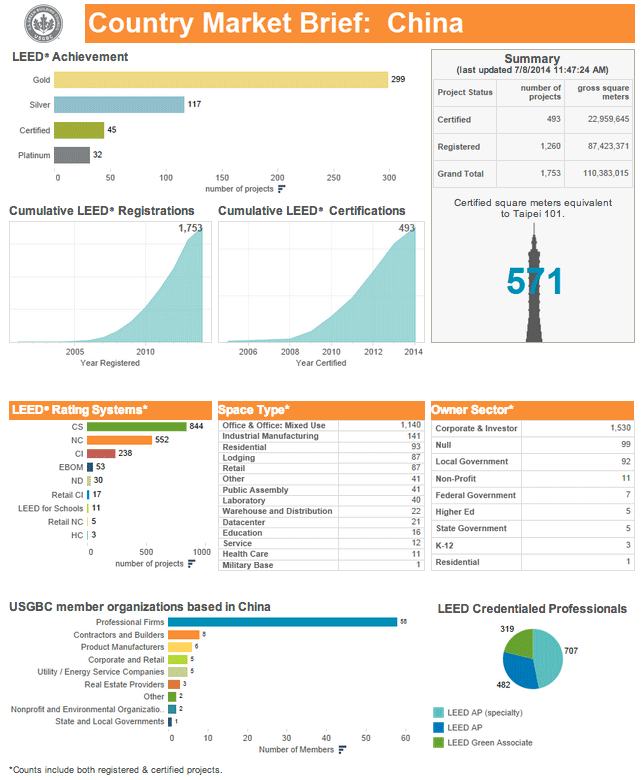 To complement the U.S. state market briefs released in the spring, these new data visualizations give a snapshot of what LEED looks like in countries across the globe. You can now find a direct link to both the state and country market briefs on the right side of the advocacy campaigns page. So even if your favorite country’s football team isn’t in the World Cup final, check out what kind of points the nation is scoring for green building. Click the image below to go to the landing page for the country market briefs. Then, pick a country from the list, and the brief will automatically update with all of the most up-to-date information. You can hover over any point on a graph to get specific information. To print the market brief, click on the export button (a tray with an arrow in the middle at the bottom of the visualization) and choose to save as a PDF. Open the PDF to print or share from the Adobe Reader file. Please note that the Canadian brief includes data provided by the Canada Green Building Council and the India brief includes data provided by the Indian Green Building Council.